10-frame beginner hive kit. 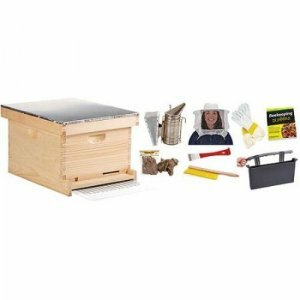 Everything a new beekeeper needs to get started, except for the bees. Features 1 Langstroth hive. Hive includes telescoping outer cover with protective metal layer, vented inner cover, wooden frames with wax-coated black plastic foundation, screened bottom board, mite grid, and entrance reducer. Included in the kit: gloves, veil, smoker, smoker fuel, bee brush, hive tool, frame feeder, and the book Beekeeping for Dummies.